I really like this software. It is very easy to learn with nice fonts. I absolutely love this software! It is easy to use and just what I needed. Will upgrade as I need to, and thankful that this program is upgradeable. I’m new to machine embroidery and this is the second program I’ve used. 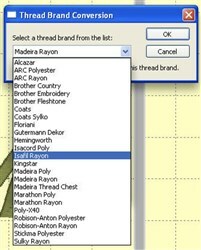 I find it easier to do what I need and I live to that ability to change my thread to the brand I use. Very pleased. Excellent program and easy to use, very handy program. I was a bit concerned getting into the software but it is VERY easy to use and load items into! Allows so much creativity! I've just started using the software...it will take me a few times to get used to, but looks like it will do what I'm needing. Some of the information needs more explanation than what is given. Easy to install. Easy to use. Already made a lot of family gifts. This is such an easy to use, intuitive software that I can't say enough about it. I highly recommend it to anyone who does machine embroidery. 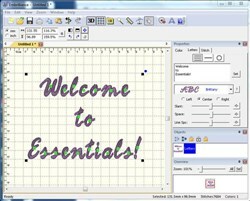 Now that I have it I wish I had bought the whole bundle of Embrilliance software. The little that I have used it, it works great. Looks like there are many possibilities. 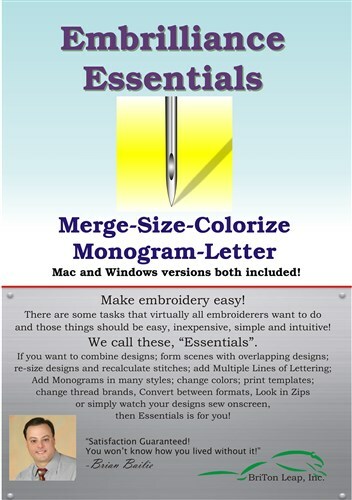 Make embroidery easy! 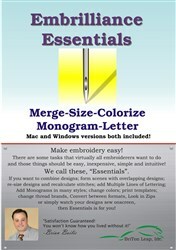 Whether you need to combine, resize, convert or add multiple lines of lettering this is the software for you!